Com Art Colours are non-toxic, airbrush-ready water-based acrylic paints that also work great with a paintbrush. They dry instantly to a matte finish for precise color matching and are re-workable on most surfaces. 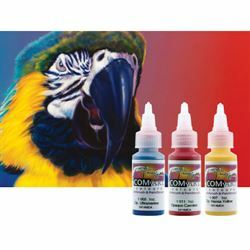 Com Art Colours are lightfast and use the finest ground pigments so they will spray smoothly and won't clog your airbrush. Opaque and transparent colours can be intermixed without bleeding or show-through. Made in the USA, Com Art Colours are available in Opaque, Transparent, and a variety of specialty colours such as Photo Grays, Flesh Tones, Metallics, Weathering and Scenery colours, Varnishes, and Repro Colors.